Plants are the lungs of the earth: they produce the oxygen that makes life possible, add precious moisture, and filter toxins. Houseplants can perform these essential functions in your home or office with the same efficiency as a rainforest in our biosphere. In research designed to create a breathable environment for a NASA lunar habitat, noted scientist Dr. B. C. Wolverton discovered that houseplants are the best filters of common pollutants such as ammonia, formaldehyde, and benzene. Hundreds of these poisonous chemicals can be released by furniture, carpets, and building materials, and then trapped by closed ventilation systems leading to the host of respiratory and allergic reactions now called Sick Building Syndrome. In this full-color, easy-to-follow guide, Dr. Wolverton shows you how to grow and nurture 50 plants as accessible and trouble-free as the tulip and the Boston fern, and includes many beautiful but commonly found varieties not generally thought of as indoor plants. He also rates each plant for its effectiveness in removing various pollutants, and its ease of growth and maintenance. Studies show that Americans spend ninety percent of their lives indoors, which means that good indoor air quality is vital for good health. How to Grow Fresh Air will show you how to purify the environment that has the most impact on you. Eco-Friendly Houseplants was originally published in 1996 by Weidenfeld & Nicolson (London). It was released in the United States as How to Grow Fresh Air in April 1997 by Penguin Books. This release included a six-city book tour with additional newspaper, magazine and radio coverage. It has now been translated into 16 languages. 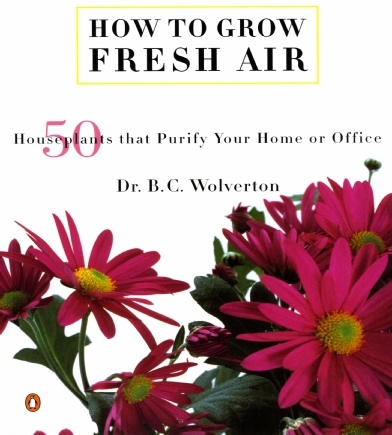 Due to its popularity under the U.S. title, it was also re-released in the United Kingdom in paperback as How to Grow Fresh Air. All releases are basically the same book with subtle changes to accommodate language translations. Listed below are the publishing companies of each translation. However, not all translations are still in print. Lemon Tree Intl. Book Publishing Co.